The 1970 South African Grand Prix, formally titled the Fourth AA Grand Prix of South Africa (Afrikaans: Vierde AA Suid-Afrikaanse Grand Prix), was a Formula One motor race held at Kyalami Circuit on 7 March 1970. It was race 1 of 13 in both the 1970 World Championship of Drivers and the 1970 International Cup for Formula One Manufacturers. It was also the last Formula One victory for triple world champion Jack Brabham. Two times World Champion and five times Monaco Grand Prix winner Graham Hill, driving a Lotus 49C for Rob Walker, made his return to racing after a life-threatening crash in the 1969 United States Grand Prix. Despite extensive knee surgery that left Hill with minimal mobility, he finished sixth. Hill rated this achievement as among his finest. After the race, he could not get out of the car by himself and had to be lifted out. 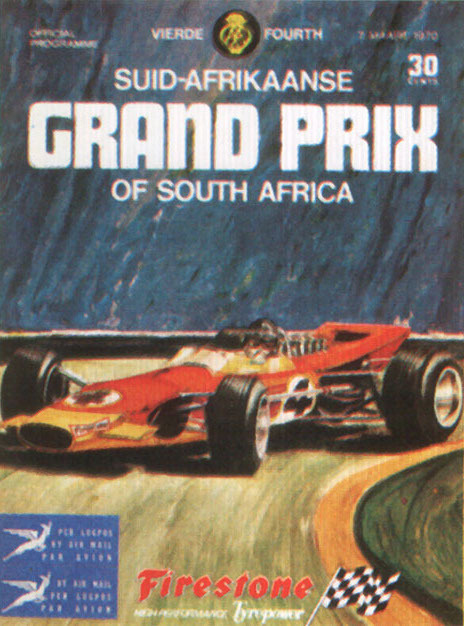 ^ "1970 Formula One Programmes: South Africa". Motor Racing Programme Covers. The Programme Covers Project. Retrieved 10 April 2015. ^ a b "The Grand Prix of South Africa". Motor Sport: 30. April 1970. ^ "1970 South African Grand Prix". formula1.com. Archived from the original on 31 October 2013. Retrieved 22 December 2015. ^ a b "South Africa 1970 - Championship • STATS F1". www.statsf1.com. Retrieved 20 March 2019. "chicanef1.com". Retrieved 7 July 2009. "South Africa 1970 – Laps Led". statsf1.com. Retrieved 6 July 2014. "MotorSport". MotorSport. 46 (4): 324–326, 330–331. April 1970. Archived from the original on 14 July 2014. Retrieved 19 January 2016.